Daniel and I have fabulous front row tickets to the Chamber Music series at Disney Hall. 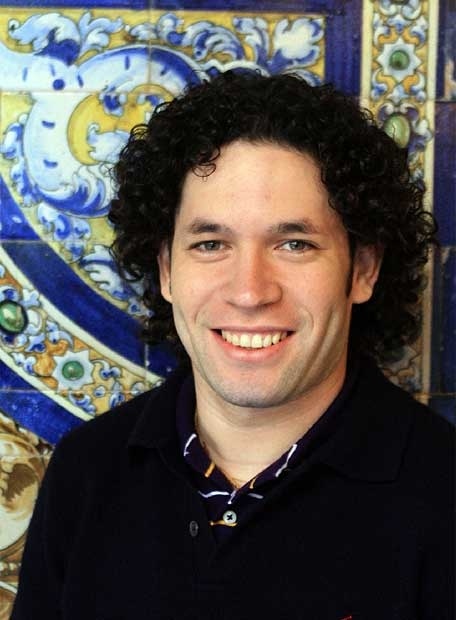 On Tuesday, Josie (his mother) and I went to a concert that featured our new conductor, Gustavo Dudamel. Like us, everyone was anxious to see him in action. But here he played second violin in the Mozart Clarinet Quintet in A — a part that doesn’t have a huge amount to do with the exception of keeping the harmonies filled out and the motion going. In the rare moment that his part came to the fore, he would start moving and swaying and tightening that adorable dimple in his cheek. When Gustavo plays, it occurred to me that notes come from his entire body — you know how on a garden hose’s nozzle, there are different settings: the spray, the intense wide range spray, the single stream intense spray, and the one that comes out gently — such are Gustavo’s settings. But the one he used most often last night was the intense single stream pointed at the balconies. His body would lean back, he would take a big breath, and one long beautiful note went flying towards the balcony. I loved watching his interaction with the 1st violinist, Martin Chalifour — everything felt like healthy conversations between friends. Mr Dudamel has an intense little vibrato — it reminded me of the Kolisch Quartet recordings, an almost early 20th century German sound. I am confident the search committee found the right conductor for the LA Philharmonic in the early 21st century. Welcome young Gustavo! LA loves you already. My friend Tupp Turner, if he feels up to it, will hear Dudamel’s Berlioz this weekend. I envy him! Michelle Zukofsky is the principal clarinetist of the LA Phil? What a great player she is, based on what I heard last fall. She has a remarkable tone; everything she does seems so beautiful and effortless. In re. the Berlioz, Prokofiev, and Salonen, I haven’t checked to see what Tupper thought, or if he was able to make it, but evidently Swed was reasonably pleased with “D-day”, even with the impossibly high expectations.